I have been going to the gym on and off my whole life, but usually a good gym period has end because some sort of inconvenience. The top ones have been opening hours of the gym or the high membership fee in some cases. Then me and my girlfriend noticed Fitness24seven popping up on every second street crossing like it was Espresso House. With the membership fee at 199SEK a month and open 24-hours 7-days a week (hence the name, du’h…) my top two inconveniences are gone. The membership is valid for all of the gyms, which are 12 just in my home town and around 50 in total in Sweden. The gyms are bright, tidy and they are equipped with a wide selection of modern high quality machines and free weights from such as TechnoGym and GymTec. This time around I think I have found a gym that fits me, in double entendre! It is now soon a year since I signed up at Fitness24seven and I have very recently done my 200th work-out there. 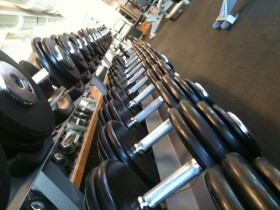 I have not been more satisfied with a gym then I am with Fitness24seven! I am there to stay for as long as they keep the standard up. ← B&W XT8, Design speakers with hi-fi qualities. Thank you for some other great article. Where else may anyone get that type of information in such an ideal approach of writing?